The Handbook of Formal Argumentation is a community effort aimed at providing a comprehensive and up-to-date view of the state of the art and current trends in the lively research field of formal argumentation. The first volume of the Handbook is organised into five parts, containing nineteen chapters in all, each written by leading experts in the field. The first part provides a general and historical perspective on the field. The second part gives a comprehensive coverage of the argumentation formalisms available in the literature at various levels of abstraction. The third part is devoted to cover some of the many dialogical aspects of argumentation, while the fourth one deals with algorithmic, computational and implementation issues. Finally, the fifth part provides some deeper analyses on the previously introduced topics. 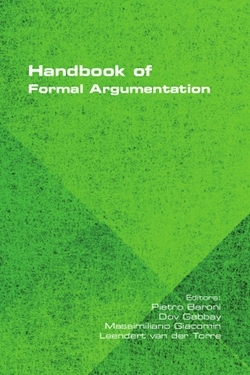 The Handbook of Formal Argumentation is an open-ended initiative of which the present volume is the first outcome. Further volumes are planned to cover topics not included in the present one and the initiative is conceived to grow by the support and feeding it receives from the community members.